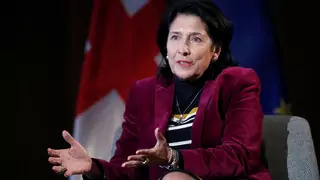 On Friday, Salome Zurabishvili won a contentious run-off election in Georgia, making her the country’s first female president, and the first in a post-Soviet republic outside the Baltic states. Born in France, Zurabishvili, the daughter of Georgian refugees, formerly served as the foreign minister. As Georgia transitions to a parliamentary republic, the authority of the president’s office will become largely ceremonial, and Zurabishvili will be the last president elected by direct vote. Female political participation elsewhere in Georgian politics remains low, with women comprising only 16 percent of the parliament. Last week, Major General Alenka Ermenc took over as the Slovenian army chief of staff, becoming the first woman in charge of the armed forces in any NATO country. Ermenc has served in the army since Slovenia’s independence in 1991 and was deputy-chief of staff until her promotion. Slovenian President Borut Pahor wrote in a statement that Ermenc’s appointment is based on her rich leadership experience. Her promotion comes on the heels of a difficult year for the Slovenian military, which recently failed a NATO combat readiness test. The United Nations Office on Drugs and Crime’s (UNODC) new report on global homicides finds that women face the greatest danger of being killed within their own homes. Globally, 58 percent of the 87,000 female homicide victims in 2017 were murdered by a relative or intimate partner. Countries around the world have initiated legal efforts to curb the killing of women and girls—often termed “femicide”—but the report cautions that legal approaches alone are insufficient. UNODC Executive Director Yury Fedotov explained that femicide is a result of gender inequality and discrimination, and “is indicative of an imbalance in power relations between women and men inside the domestic sphere.” The report concludes that progress in combating violence against women has stagnated, and calls for criminal justice reform, education, and early-intervention programs to reduce domestic violence.